Lemnos (Greek: Λήμνος; Ancient Greek: Λῆμνος) is a Greek island in the northern part of the Aegean Sea. Administratively the island forms a separate municipality within the Lemnos regional unit, which is part of the North Aegean region. The principal town of the island and seat of the municipality is Myrina. At 477.583 square kilometres (184.396 sq mi), it is the 8th-largest island of Greece. Lemnos is mostly flat (hence its more than 30 sand beaches), but the west, and especially the northwest part, is rough and mountainous. The highest point is Mount Skopia at the altitude of 430 m. The chief towns are Myrina, on the western coast, and Moudros on the eastern shore of a large bay in the middle of the island. Myrina (also called Kastro, meaning "castle") possesses a good harbour, which is in the process of being upgraded through construction of a west-facing sea wall. It is the seat of all trade carried on with the mainland. The hillsides afford pasture for sheep, and Lemnos has a strong husbandry tradition, being famous for its Kalathaki Limnou (PDO), a cheese made from sheep and goat milk and melipasto cheese, and for its yogurt. Fruit and vegetables that grow on the island include almonds, figs, melons, watermelons, tomatoes, pumpkins and olives. The main crops are wheat, barley, sesame; in fact Lemnos was Constantinople's granary after the Byzantine Empire lost its Anatolian possessions in the 1320s. Lemnos also produces honey (from thyme-fed bees), but, as is the case with most products of a local nature in Greece, the produced quantities are little more than simply sufficient for the local market. Muscat grapes are grown widely, and are used to produce an unusual table wine that is dry yet has a strong Muscat flavor. Since 1985 the variety and quality of Lemnos wines have increased greatly. The climate in Lemnos is mainly Mediterranean. Winters are generally mild, but there will be a snowfall occasionally. Strong winds are a feature of the island, especially in August and in winter time, hence its nickname "the wind-ridden one" (in Greek, Ανεμόεσσα). The temperature is typically 2 to 5 degrees Celsius less than in Athens, especially in summertime. For ancient Greeks, the island was sacred to Hephaestus, god of metallurgy, who—as he tells himself in Iliad I.590ff—fell on Lemnos when Zeus hurled him headlong out of Olympus. There, he was cared for by the Sinties, according to Iliad, or by Thetis (Apollodorus, Bibliotheke I:3.5), and there with a Thracian nymph Cabiro (a daughter of Proteus) he fathered a tribe called the Kaberoi. Sacred initiatory rites dedicated to them were performed in the island. Its ancient capital was named Hephaistia in the god's honour. Hephaestus' forge, which was located on Lemnos, as well as the name Aethaleia, sometimes applied to it, points to its volcanic character. It is said that fire occasionally blazed forth from Mosychlos, one of its mountains. The ancient geographer Pausanias relates that a small island called Chryse, off the Lemnian coast, was swallowed up by the sea. All volcanic action is now extinct. The earliest inhabitants are said to have been a Thracian tribe, whom the Greeks called Sintians, "robbers". The name Lemnos is said by Hecataeus to have been applied in the form of a title to Cybele among the Thracians. The worship of Cybele was characteristic of Thrace, where it had spread from Asia Minor at a very early period. Hypsipyle and Myrina (the name of one of the chief towns) are Amazon names, which are always connected with Asiatic Cybele-worship. According to the epitome of the Bibliotheke traditionally attributed to Apollodorus (Epitome I:9), when Dionysus found Ariadne abandoned on Naxos, he brought her to Lemnos and there fathered Thoas, Staphylus, Oenopion, and Peparethus. Pliny the Elder in his Natural History (xxxvi. 13) speaks of a remarkable labyrinth in Lemnos, which has not been identified in modern times. According to a Hellenic legend, the women were all deserted by their husbands for Thracian women, and in revenge they murdered every man on the island. From this barbarous act, the expression Lemnian deeds became proverbial among the Hellenes. According to Apollonius of Rhodes' Argonautica the Argonauts landing soon after found only women in the island, ruled by Hypsipyle, daughter of the old king Thoas. From the Argonauts and the Lemnian women were descended the race called Minyans, whose king Euneus, son of Jason and Hypsipyle, sent wine and provisions to the Achaeans at Troy. According to later Greek historians, the Minyans were expelled by a Pelasgian tribe who came from Attica. The historical element underlying these traditions is probably that the original Thracian people were gradually brought into communication with the Greeks as navigation began to unite the scattered islands of the Aegean; the Thracian inhabitants were technologically primitive in comparison with the Greek mariners. In another legend, Philoctetes was left on Lemnos by the Greeks on their way to Troy; and there he suffered ten years' agony from his wounded foot, until Odysseus and Neoptolemus induced him to accompany them to Troy. According to Sophocles, he lived beside Mount Hermaeus, which Aeschylus makes one of the beacon points to flash the news of Troy's downfall home to Argos. Building at the hill of Poliochne, dating from the Early Bronze Age. Lemnos stele, Lemnian (related to Etruscan) inscriptions discovered in a crypt. The ruins of the oldest human settlement in the Aegean Islands found so far have been unearthed in archaeological excavations on Lemnos by a team of Greek, Italian and American archaeologists at the Ouriakos site on the Louri coast of Fyssini in Moudros municipality. The excavation began in early June 2009 and the finds brought to light, consisting mainly of high quality stone tools, are from the Epipaleolithic Period, indicating a settlement of hunters and gatherers and fishermen of the 12th millennium BC. A rectangular building with a double row of stepped seats on the long sides, at the southwest side of the hill of Poliochne, dates back to the Early Bronze Age and was possibly used as a kind of Bouleuterion. The lack of weapons of bronze, the abundance of weapons of iron, and the type of the pots and the pins gives the impression that the necropolis belongs to the ninth or eighth century B.C. That it did not belong to a Greek population, but to a population which, in the eyes of the Hellenes, appeared barbarous, is shown by the weapons. The Greek weapon, dagger or spear, is lacking: the weapons of the barbarians, the axe and the knife, are common. Since, however, this population … preserves so many elements of Mycenaean art, the Tyrrhenians or Pelasgians of Lemnos may be recognized as a remnant of a Mycenaean population. Homer speaks as if there were one town in the island called Lemnos. In Classical times there were two towns, Myrina (also called Kastro) and Hephaistia, which was the chief town. Coins from Hephaestia are found in considerable number, and various types including the goddess Athena with her owl, native religious symbols, the caps of the Dioscuri, Apollo, etc. Few coins of Myrina are known. They belong to the period of Attic occupation, and bear Athenian types. A few coins are also known which bear the name of the whole island, rather than of either city. A trace of the Lemnian language is found on a 6th-century inscription on a funerary stele, the Lemnos stele. Lemnos later adopted the Attic dialect of Athens. Coming down to a better authenticated period, it is reported that Lemnos was conquered by Otanes, a general of Darius Hystaspis. But soon (510 BC) it was reconquered by Miltiades the Younger, the tyrant of the Thracian Chersonese. Miltiades later returned to Athens and Lemnos was an Athenian possession until the Macedonian empire absorbed it. By 450 BC, Lemnos was an Athenian cleruchy. The Athenian settlers brought with them Athenian drama, dated to at least 348 BC. However, the tradition of theater seems to date back to the 5th century, and recent excavations at the site Hephaisteia suggest that the theater dated to the late 6th to early 5th century. In 197 BC, the Romans declared it free, but in 166 BC gave it over to Athens which retained nominal possession of it until the whole of Greece was made a province of the Roman Republic in 146 BC. After the division of the Roman Empire in 395, Lemnos passed to the Byzantine Empire. View of the fortress of Myrina. Medieval fort in Skala village. As a province of the Byzantine Empire, Lemnos belonged to the theme of the Aegean Sea, and was a target of Saracen raids in the 10th century and of Seljuk raids in the 11th century. Following the dissolution and division of the Empire after the Fourth Crusade, Lemnos (known by Westerners as Stalimene) was apportioned to the Latin Empire, and given as a fief to the Navigajoso family under the Venetian (or possibly of mixed Greek and Venetian descent) megadux Filocalo Navigajoso. Filocalo died in 1214, and was succeeded by his son Leonardo and his daughters, who partitioned the island into three fiefs between them. Leonardo retained the title of megadux of the Latin Empire and half the island with the capital, Kastro, while his sisters and their husbands received one quarter each with the fortresses of Moudros and Kotsinos. Leonardo died in 1260 and was succeeded by his son Paolo Navigajoso, who resisted Byzantine attempts at reconquest until his death during a siege of the island by the Byzantine admiral Licario in 1277. Resistance continued by his wife, but in 1278 the Navigajosi were forced to capitulate and cede the island back to Byzantium. During the last centuries of Byzantium, Lemnos played a prominent role: following the loss of Asia Minor, it was a major source of food, and it played an important role in the recurring civil wars of the 14th century. As the Ottoman threat mounted in the 15th century, possession of Lemnos was demanded by Alfonso V of Aragon in exchange for offering assistance to the beleaguered Byzantines, while the last Byzantine emperor, Constantine XI Palaiologos, offered it to the Genoese captain Giustiniani Longo, if the Ottoman besiegers were driven off. Dorino I Gattilusio, the ruler of Lesbos, also acquired Lemnos as his fief shortly before the Fall of Constantinople in 1453. Following the Fall of Constantinople, and thanks to the intercession of Michael Critobulus, the Dorino I Gattilusio's possession of Lemnos (and Thasos) was recognized by Sultan Mehmed II, in exchange for an annual tribute of 2,325 gold coins. When Dorino died in 1455, his son and successor Domenico was only granted for Lemnos, however. In 1456, Mehmed II attacked and captured the Gattilusi domains in Thrace (Ainos and the islands of Samothrace and Imbros). During the subsequent negotiations with Domenico Gattilusio, the Greek populace of Lemnos rose up against Domenico's younger brother Niccolò Gattilusio, and submitted themselves to the Sultan, who appointed a certain Hamza Bey as governor under the Bey of Gallipoli, Isma'il. Mehmed granted a special legal charter (kanun-name) to Lemnos, Imbros, and Thasos, at this time, later revised by Selim I in 1519. In 1457, the island was captured by a Papal fleet under Cardinal Ludovico Scarampi Mezzarota. Pope Callixtus III hoped to establish a new military order on the island, which controlled the exit of the Dardanelles, but nothing came of it as Isma'il Bey soon recovered Lemnos for the Sultan. In 1464, during the First Ottoman–Venetian War, Lemnos and other former Gattilusi possessions were seized by the Venetians, but were returned to the Ottomans by the 1479 Treaty of Constantinople. In the aftermath, the Kapudan Pasha, Gedik Ahmed, repaired the island's fortifications and brought in settlers from Anatolia. At this time, the administration of the island was also reformed and brought in line with Ottoman practice, with a governor (voevoda), judge (kadi), and elders (kodjabashis) heading the local Greek inhabitants. In the late 16th century, Lemnos is recorded, along with Chios, as "the only prosperous island of the Archipelago". It had 74 villages, of which 3 were inhabited by Turkish Muslims. In July 1656, during the Fifth Ottoman–Venetian War, the Venetians captured the island again following a major victory over the Ottoman fleet. The Ottomans under Topal Mehmed Pasha recovered it barely a year later, on 15 November 1657, after besieging the capital of Kastro for 63 days. In 1770, Kastro was besieged again for 60 days by Count Orlov during the Russo-Turkish War of 1768–1774. The fortress had just surrendered when an attack by the Ottoman fleet on the Russian vessels in Mudros Bay forced the Russians to withdraw (24 October 1770). The famous Sufi poet Niyazi Misri was exiled here for several years during the late 17th century. Under Ottoman rule, Lemnos initially belonged to the sanjaks of Gallipoli or Mytilene under the Eyalet of the Archipelago, but was constituted as a separate sanjak in the reforms of the mid-19th century, at the latest by 1846. Abolished in 1867, it was re-formed in 1879 and existed until the island's capture by the Greeks in 1912. It comprised the islands of Lemnos (Limni in Turkish), Agios Efstratios (Bozbada), Imbros (Imroz) and Tenedos (Bozcaada). The French scholar Vital Cuinet, in his 1896 work La Turquie d'Asie, recorded a population of 27,079, of which 2,450 were Muslims and the rest Greek Orthodox. View of Moudros during the Dardanelles Campaign, during WWI, with a French military wine store in the foreground and a hospital in the background. On 8 October 1912, during the First Balkan War, Lemnos became part of Greece. The Greek navy under Rear Admiral Pavlos Kountouriotis took it over without any casualties from the occupying Turkish Ottoman garrison, who were returned to Anatolia. Peter Charanis, born on the island in 1908 and later a professor of Byzantine history at Rutgers University recounts when the island was occupied and Greek soldiers were sent to the villages and stationed themselves in the public squares. Some of the children ran to see what Greek soldiers looked like. ‘‘What are you looking at?’’ one of them asked. ‘‘At Hellenes,’’ the children replied. ‘‘Are you not Hellenes yourselves?’’ a soldier retorted. ‘‘No, we are Romans." ("Romioi", literally Romans, were named by the Ottoman authorities the Greek Orthodox population of the empire). Moudros Bay became a forward anchorage for the Greek fleet, which enabled it to keep watch on the Dardanelles and prevent a foray by the Ottoman Navy into the Aegean. The Ottomans' two attempts to achieve this were beaten back in the battles of Elli and Lemnos. Thus the Ottomans were prevented from supplying and reinforcing their land forces in Macedonia by sea, a critical factor in the success of the Balkan League in the war. During World War I, the Allies in early 1915 used the island to try to capture the Dardanelles Straits, some 50 kilometres (31 miles) away. This was done chiefly by the British and largely through the enthusiasm of Winston Churchill. The harbour at Moudros was put under the control of British Admiral Rosslyn Wemyss, who was ordered to prepare the then largely unused harbour for operations against the Dardanelles. The harbour was broad enough for British and French warships, but lacked suitable military facilities, which was recognized early on. Troops intended for Gallipoli had to train in Egypt; and the port found it difficult to cope with casualties of the ill-starred Gallipoli campaign. The campaign was called off in evident failure at the close of 1915. Moudros' importance receded, although it remained the Allied base for the blockade of the Dardanelles during the war. The town of Lemnos, Victoria, Australia, established in 1927 as a soldier settlement zone for returning First World War soldiers, was named after the island. There are three Commonwealth War Graves Commission (CWGC) cemeteries on the island, the first one for the 352 Allied soldiers in Portianou, the second one for the 148 Australian and 76 New Zealander soldiers in the town of Moudros and the third one for the Ottoman soldiers (170 Egyptian and 56 Turkish soldiers). In late October 1918, the armistice between the Ottoman Empire and the Allies was signed at Moudros. After the Red Army victory in the Russian Civil War, many Kuban Cossacks fled the country to avoid persecution from the Bolsheviks. A notable evacuation point was the Greek island of Lemnos where 18,000 Kuban Cossacks landed, though many later died of starvation and disease. Most left the island after a year. Today the island of Lemnos (Limnos) has about 30 villages and settlements. The province includes the island of Agios Efstratios to the southwest which has some exceptional beaches and one of the two deserts in Europe (the other being Błędów Desert in Poland). Lemnos and the smaller island of Agios Efstratios previously formed part of Lesbos Prefecture. In 2011, the prefecture was abolished and Lemnos and Agios Efstratios now form Lemnos Regional Unit. Lemnos Province, abolished in 2006, comprised the same territory as the present regional unit. In 2001 the island had 12,116 regular dwellings, of which 65% were stone-built, and 90.2% had pitched roofs made of red tiles (source: 18.3.2001 Census, National Statistical Service of Greece). The island's economically active population in 2001 was 6,602. Of them, 12% were employers, 20.5% self-employed, 55.3% wage-earners, 7.1% unpaid, auxiliary family members, and 5.1% did not declare line of occupation. Of the economically active population, 17.9% worked in agriculture, 5.3% in light manufacturing, 11% in construction, 6.7% in hotels & restaurants, and the rest in other lines of business (source: 2001 Census, National Statistical Service of Greece). The only airport is Lemnos International Airport, 18 kilometres (11 mi) east of Myrina. The island is well served by ferries from Piraeus (Athens), Laurium, Thessaloniki and Kavala. ^ Nigel Wilson (31 October 2013). Encyclopedia of Ancient Greece. Routledge. p. 421. ISBN 978-1-136-78800-0. ^ "Recognition of Protected Designation of Origin". World Intellectual Property Organization. ^ Kottek, M.; J. Grieser; C. Beck; B. Rudolf; F. Rubel (2006). "World Map of the Köppen-Geiger climate classification updated" (PDF). Meteorol. Z. 15 (3): 259–263. doi:10.1127/0941-2948/2006/0130. Retrieved January 29, 2013. ^ "Limnos Island Climate Normals 1961-1990". National Oceanic and Atmospheric Administration. Retrieved January 29, 2013. ^ Bryant, Jacob (1807). A New System: Or, An Analysis of Antient Mythology. J. Walker. p. 420. Retrieved 12 August 2016 – via Google Books. ^ A short account of their excavations appeared in the Messager d'Athènes for January 3, 1927. ^ Heffner, Edward H. "Archaeological News: Notes on Recent Archaeological Excavations and Discoveries; Other News" (July–December 1926). American Journal of Archaeology. Vol. 31, No. 1 (January 1927), pp. 99–127, especially pp. 123–124. ^ "Hephaistia". Pleiades, directory of Ancient Places. ^ a b c Gregory, Timothy E. (1991). "Lemnos". In Kazhdan, Alexander (ed.). The Oxford Dictionary of Byzantium. Oxford and New York: Oxford University Press. p. 1205. ISBN 0-19-504652-8. ^ a b c d e f g h de Groot, A. H. (1986). "Limni". In Bosworth, C. E.; van Donzel, E.; Lewis, B.; Pellat, Ch. (eds.). The Encyclopaedia of Islam, New Edition, Volume V: Khe–Mahi. Leiden: E. J. Brill. pp. 763–764. ISBN 90-04-07819-3. ^ Van Tricht, Filip (2011). The Latin Renovatio of Byzantium: The Empire of Constantinople (1204–1228). Leiden: Brill. pp. 112, 130, 144. ISBN 978-90-04-20323-5. ^ a b c d e f g Kramers, J. H. (1987). "Limni". In Houtsma, Martijn Theodoor (ed.). E.J. Brill's first encyclopaedia of Islam, 1913–1936, Volume V: L–Moriscos. Leiden: BRILL. pp. 27–28. ISBN 90-04-08265-4. ^ Birken, Andreas (1976). Die Provinzen des Osmanischen Reiches. Beihefte zum Tübinger Atlas des Vorderen Orients (in German). 13. Reichert. p. 105. ISBN 9783920153568. This article incorporates text from a publication now in the public domain: Chisholm, Hugh, ed. (1911). "Lemnos" . Encyclopædia Britannica. 16 (11th ed.). Cambridge University Press. pp. 412–413. Agios Efstratios or Saint Eustratius (Greek: Άγιος Ευστράτιος), colloquially Ai Stratis (Greek: Άη Στράτης), anciently Halonnesus or Halonnesos (Ancient Greek: Ἁλόννησος), is a small Greek island in the northern Aegean Sea about 30 kilometres (19 miles) southwest of Lemnos and 80 kilometres (50 miles) northwest of Lesbos. The municipality has an area of 43.325 km2. Together with Lemnos and nearby islets it forms the regional unit of Lemnos, part of the Greek archipelagic region of the North Aegean. The Battle of Lemnos (Greek: Ναυμαχία της Λήμνου, Turkish: Mondros Deniz Muharebesi), fought on 18 January [O.S. 5 January] 1913, was a naval battle during the First Balkan War, which defeated the second and last attempt of the Ottoman Empire to break the Greek naval blockade of the Dardanelles and reclaim supremacy over the Aegean Sea from Greece. Chryse (Greek: Χρύση, translit. Khrúsē, lit. 'Golden') was a small island in the Aegean Sea mentioned by Homer, Sophocles and Pausanias. The following incident proves the might of Fortune to be greater and more marvellous than is shown by the disasters and prosperity of cities. No long sail from Lemnos was once an island Chryse, where, it is said, Philoctetes met with his accident from the water-snake. But the waves utterly overwhelmed it, and Chryse sank and disappeared in the depths... So temporary and utterly weak are the fortunes of men. An amateur underwater archaeologist claimed to have rediscovered the island in 1960, identifying it with "a sunken land mass known as Kharos Bank, a 10-sq.-mi. area near the island of Lemnos", listed on British naval charts and located about 40 feet (12 m) below the surface. White building blocks (presumably from Apollo's temple) were said to be visible on the sea floor. The Kharos Bank is mentioned by others as a possible site, but there does not appear to have been further work on it. The Goulburn Valley Football League (GVFL) is an Australian rules football competition based in the Goulburn Valley region of Victoria, Australia. Participating clubs also field netball teams that compete in a concurrent league. It is a member of the Victorian Country Football League and has won the Victorian Country Football Championships in 2003 and 2005. Lemnos, sometimes spelled Limnos (Greek: Θ/Κ Λήμνος), was a 13,000 ton Mississippi-class battleship originally built by the United States Navy in 1904–1908. As Idaho, she was purchased by the Greek Navy in 1914 and renamed Lemnos, along with her sister Mississippi, renamed Kilkis. Lemnos was named for the Battle of Lemnos, a crucial engagement of the First Balkan War. Armed with a main battery of four 12 in (305 mm) guns, Lemnos and her sister were the most powerful vessels in the Greek fleet. The ship saw limited action during World War I. Greece's pro-German monarch, Constantine I opted to remain neutral until October 1916, when pressure from the Triple Entente forced him to abdicate in favor of a pro-Entente government. For the remainder of the war, Lemnos operated solely as a harbor defense ship. In the aftermath of World War I, she saw service during the Allied intervention in the Russian Civil War and the Greco-Turkish War of 1919–1922. During the war with Turkey, Lemnos supported Greek landings in Turkey and participated in the final Greek sea-borne withdrawal in 1922. She remained in service until 1932, when she was used as a barracks ship and subsequently disarmed. During the German invasion of Greece in 1941, she and her sister were sunk in Salamis by German Junkers Ju 87 dive bombers. The two ships were ultimately raised and broken up for scrap after the end of the war. USS LST-36 was an LST-1-class tank landing ship of the United States Navy built during World War II. She was transferred to the Royal Hellenic Navy on 23 August 1943, before being commissioned into the USN, and was renamed Lemnos (Λήμνος). Ifaistos Limnou B.C. (also: Ifestos Limnou B.C. or Hephaestus Lemnos B.C.) (Greek: Ήφαιστος Λήμνου K.A.E. ), previously commonly known as Gymnastikos S. Larissas Faros, G.S. Larissas Faros, or G.S.L. Faros, is a Greek professional basketball club that is based on the Greek island of Lemnos, in Myrina. The club is named after the Greek god Hephaestus. The club was previously based in Larissa, Greece, with the club’s colors being green, white, and blue, and its emblem being the Discobolus. The club is well-known for being the first team of the legendary European basketball player, Vassilis Spanoulis. The club currently plays in Greece's top-tier level, the Greek Basket League. Kontopouli (Greek: Κοντοπούλι) is a village and a community in the municipal unit of Moudros in the northeastern part of the island of Lemnos, Greece. In 2011 its population was 623 for the village and 634 for the community, which includes the small villages Agios Alexandros and Agios Theodoros. Its total area is 37.04 km². Kontopouli is 1 km northwest of Kalliopi, 3 km east of Repanidi and 8 km northeast of Moudros. There are several small farming settlements around Kontopouli. Most of them are presently uninhabited, but some date back to the Byzantine era. The most important of these is Agios Alexandros. Other villages are Dimosia, Agios Georgios Amniou (near the Alyki lake), Neftina (on the bay in the northwest where the Turkish manor of Haji Pasha was located), Agios Theodoros (also Saravari) and Geranos (also Ageranou). Koukonesi is a small island, situated in the Moudros harbour, west of Poliochne, on the island of Lemnos in the Aegean Sea. The island is a very important archaeological find due to its possible links with Troy. It has been found that Koukonesi towns are of the same chronological period with some of the cities of Troy. The best preserved settlements found on Koukonesi are from the Middle Bronze Age, 2000 BC—1650 BC. The findings have shown that Koukonesi's inhabitants had close commercial relations with Asia Minor, other Aegean Sea islands and mainland Greece. Greek archaeologists also discovered Mycenaean ceramics of the late 13th century BC which may prove that a permanent settlement was established around the epoch of the Trojan war. The Lemnian language was a language spoken on the island of Lemnos in the 6th century BC. It is mainly attested by an inscription found on a funerary stele, termed the Lemnos stele, discovered in 1885 near Kaminia. Fragments of inscriptions on local pottery show that it was spoken there by a community. In 2009, a newly discovered inscription was reported from the site of Hephaistia, the principal ancient city of Lemnos. Lemnian is largely accepted as being closely related to Etruscan. 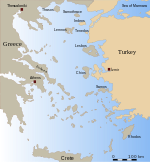 After the Athenians conquered the island in the latter half of the 6th century BC, Lemnian was replaced by Attic Greek. Lemnos (Greek: Περιφερειακή ενότητα Λήμνου) is one of the regional units of Greece. It is part of the region of North Aegean. The regional unit covers the islands of Lemnos, Agios Efstratios and a few smaller, uninhabited islands, in the Aegean Sea. Lemnos International Airport "Hephaestus" (IATA: LXS, ICAO: LGLM) is an airport on Lemnos Island, Greece. The airport is located 18km away from the city of Myrina and began operation in 1959. Lesbos Prefecture (Greek: Νομός Λέσβου) was one of the prefectures of Greece. It comprised three main islands: Lesbos itself, Lemnos, and the smaller island of Agios Efstratios. Its capital was the town of Mytilene, on Lesbos. In 2011 the prefecture was abolished and the territory was divided between the regional units of Lesbos and Lemnos. Limnio (LIM-nee-oh) is a red Greek wine grape variety that is indigenous to the Greek island of Lemnos. The grape has had a long history of wine production that may extend back to Ancient Greece with wine historians widely believing it was the grape variety, Lemnia, that was described by Aristotle as producing the famous red Lemnian wine. According to wine expert Oz Clarke, Limnio is "One of Greece's most important red vines." Livadochori (Greek: Λιβαδοχώρι) is a village and a community in the Greek island of Lemnos, part of the municipal unit Nea Koutali. In 2011 its population was 237 for the village, and 373 for the community, which includes the village Poliochni. It is situated in the central part of the island, 1 km northwest of Kallithea, 2 km north of Nea Koutali, 7 km northwest of Moudros and 12 km northeast of Myrina. The Lemnos International Airport is 3 km east. Moudros (Greek: Μούδρος) is a town and a former municipality on the island of Lemnos, North Aegean, Greece. Since the 2011 local government reform it is part of the municipality Lemnos, of which it is a municipal unit. It covers the entire eastern peninsula of the island, with a land area of 185.127 km², covering 38.8% of the island's territory. The municipal seat was the town of Moúdros (pop. 974). Its next largest town is Kontopoúli (623). The municipal unit's total population was 3,925 in the 2011 census. Philoctetes (Ancient Greek: Φιλοκτήτης Philoktētēs; English pronunciation: , stressed on the third syllable, -tet-), or Philocthetes, according to Greek mythology, was the son of King Poeas of Meliboea in Thessaly. He was a Greek hero, famed as an archer, and a participant in the Trojan War. Philoctetes was the subject of four different plays of ancient Greece, each written by one of the three major Greek tragedians. Of the four plays, Sophocles' Philoctetes is the only one that has survived. Sophocles' Philoctetes at Troy, Aeschylus' Philoctetes and Euripides' Philoctetes have all been lost, with the exception of some fragments. Philoctetes is also mentioned in Homer's Iliad, Book 2, which describes his exile on the island of Lemnos, his being wounded by snake-bite, and his eventual recall by the Greeks. The recall of Philoctetes is told in the lost epic Little Iliad, where his retrieval was accomplished by Diomedes. Philoctetes killed three men at Troy. Repanidi (Greek: Ρεπανίδι) is a village and a community in the northeast of the island of Lemnos, Greece. It is part of the municipal unit of Moudros. It is located 2 km northeast of Romanou, 3 km west of Kontopouli, 3 km east of Lychna, 6 km northeast of Moudros and 21 km northeast of Myrina. In 2011 its population was 266 people. Its elevation is 30 m.